This famous Mexican dish is of course based on the avocado, which is known by many names around the world. Ahuacatl by the Aztecs, the ancient Incan name palta is still used in Chile, Peru and Ecuador, in West Africa it is called custard apple, in Spain it is known as abogado and in French it is avocat. It apparently grew wild throughout Central America and Mexico as early as 900 AD. First evolving into three distinct varieties - Guatemalan, Mexican and West Indian and from these there are now over four hundred varieties. Avocados are a rarity in the fruit and vegetable world as they contain fat but this is the same mono-unsaturated fatty acids found in olives, which helps to lower cholesterol while contributing nothing to your bad cholesterol count. They also contain antioxidants and vitamins A, B1, B2, B3, B6, C and E . . . they are also high in protein and fibre. So all in all a very healthy addition to your diet. Dont like the taste of avocados? Well the vitamins B1, B2, B3 and E are great if applied externally on your skin as a facial mask! Look for those that the skin has darkened. Bright green normally means they are not yet ripe (some smooth species do however remain bright green even as they ripen). If the stalk is still attached try to wiggle it, the more it wiggles the riper the fruit. Ignore the store sign that says Do not press / squeeze the fruits and gently press the avocado at the stalk end (the thinnest end). It should give under gentle pressure if ripe. If all else fails and you cannot find ripe ones, buy the unripe ones and take them home. Place in a plastic or paper bag with an apple, tie up the bag and leave in a warm place for a day or two. 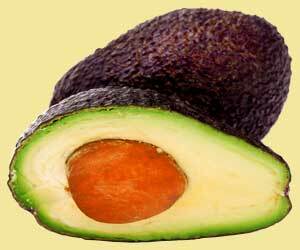 A gas the apple releases will encourage the avocado to ripen!